Charlie Brown’s quiet friend and confidant, Franklin might be the only one who never has an unkind word about our hapless hero. At school, Franklin sits one seat ahead of Peppermint Patty, which makes his school days that much more unbearable. Did you know: Franklin goes to school with Peppermint Patty and Marcie but visits his friend Charlie Brown in a nearby neighborhood. First appearance: April 23rd, 1981 Franklin, Charlie Brown and Lucy stand at the wall. Franklin says, "My grandfather thinks he's over the hill." Charlie Brown says, "My grandfather thinks he's over the hill and around the bend." Lucy says, "My grandfather thinks he's over the hill, around the bend, out of the swim and on the shelf!" Charlie Brown and Franklin stand at the wall. Charlie Brown says, "She alwa Latest appearance: October 18th, 2015 / First appearance: October 20th, 1968 Charlie Brown and Snoopy stand ion line at the ticket booth. Franklin stands behind Snoopy. Charlie Brown says, "One, please." Linus and Lucy stand behind Franklin. Franklin reaches over snoopy and says, "One, please." Linus reaches over Snoopy and says, "One, please." Sally and Schroeder stand behind Lucy. Lucy reaches over Snoopy and says, "One, please." S First appearance: September 18th, 1989 Charlie Brown, Franklin and Snoopy stand at the wall. Franklin says, "My grandfather says his ambition is to be a perfect grandparent." Charlie Brown asks, "What does he call a perfect grandparent?" Franklin replies, "Somebody who's made at least one hole in one . ." First appearance: September 20th, 1992 Peppermint Patty sits at her desk in school and sleeps. Peppermint Patty wears her notebook on her head. She says, "Oh, no!" Peppermint Patty continues to wear the notebook on her head. She says, "Who discovered what? Well, let me think . . . Yes, ma'am . . . It's my notebook . . It got sort of caught in my hair again . . ." Marcie sits behind Peppermint Patty. Peppermint P First appearance: May 23rd, 1988 Charlie Brown and Franklin lean on the wall. Franklin says, "The doctor told my grampa that he should take one baby aspirin every day . ." Charlie Brown asks, "Has it helped him?" Franklin replies, "Not yet." Franklin says, "He hasn't been able to get the cap off the bottle . ." First appearance: March 11th, 1984 Marcie sits hunched over her desk reading. Peppermint Patty sits in front of her, yawns, and stretches. As she falls asleep, Marcie looks up and asks Franklin, who looks back,"Hey, Franklin, did you read the chapters on left and right brains?" She says,"I think I'm a 'left-brain person'....I'm sort of analytical and I like numbers and symbols..." He looks in his book and r Latest appearance: October 15th, 2015 / First appearance: October 16th, 1968 The World War I Flying Ace sits on the doghouse. Franklin says, "Excuse me, lieutenant . ." Franklin continues, "I'm looking for a boy named Charlie Brown . . Is this where he lives?" The World War I Flying Ace points. Franklin says, "Thank you." Snoopy thinks, "Headquarters must be planning a big drive . . I don't recognize a lot of these new men . . ." First appearance: March 5th, 1979 Peppermint Patty and Franklin sit at their desks in school. Franklin says, "Spelling bee?" Franklin says, "No, ma'am . . Not unless you say I have to." Peppermint Patty whispers, "Go ahead, Franklin . . . You can do it . . ." Franklin says, "Maybe I could just be in the pro-am . . ." First appearance: December 20th, 1989 Lucy, Linus and Franklin walk away. Snoopy stands dressed as Santa Claus ringing a bell. The charity bin is filled with dog bones. Lucy says, "It is always good to give something to those Santas who stand on the corner." Franklin says, "I agree." Latest appearance: July 30th, 2015 / First appearance: August 1st, 1968 Charlie Brown and Franklin play in the sand. Charlie Brown asks, "Is your whole family at the beach, Franklin?" Franklin replies, "No, my dad is over in Vietnam." Charlie Brown says, "My dad's a barber . . He was in a war too, but I don't know which one." Franklin asks, "Do you like baseball, Charlie Brown?" Charlie Brown replies, "My problem is I like baseball too much." First appearance: December 15th, 1996 Peppermint Patty is crushed under a pile of numbers. Marcie and Peppermint Patty sit at their desks in class. Peppermint Patty says, "Subdued, Marcie . ." Peppermint Patty repeats, "Subdued." Marcie asks, "Subdued?" Peppermint Patty replies, "Subdued is the word, Marcie." Peppermint Patty tells Franklin, "It's my new theory, Franklin . . I've been too loud in clas First appearance: April 12th, 1990 Franklin, Charlie Brown, Lucy, Linus and Sally stand underneath a big tree. It rains even underneath the tree. Franklin says, "Field trips are supposed to be very educational." Lucy says, "I wonder what we've learned today . . ." Sally says, "Even if you stand under a tree you still get wet!" Latest appearance: September 21st, 2016 / First appearance: September 24th, 1969 Roy looks on while Franklin says to Peppermint Patty, "Well coach, we're ready . . . where's the other team?" Peppermint Patty replies, "I don't know . . . I told Chuck to get his outfit together, and be here at three . . ." Roy points and says, "Here comes a team now . . ." as a friend looks on. Snoopy walks onto the field wearing a helmet and 4 birds follow behind him. First appearance: June 5th, 1983 Peppermint Patty lies in bed and exclaims to find her binder on her head. She sticks her tongue out in the bathroom's mirror as she tries to take the binder off. She sits at her desk in class and says,"My report? I'm sorry, Ma'am, it's in my binder. And my binder is caught in my hair...." She continues,"I don't know....I fell asleep last night doing my homework, and there it was. First appearance: January 17th, 1985 Franklin stands in front of the class and announces, "This morning we want to pay tribute to two of our classmates . . ." Franklin continues, "Patricia and Marcie made an appearance at the teacher's convention yesterday . ." Franklin turns and says, "I think we all appreciate the honor they brought to our school . . ." Marcie stands with her arm in a sling and a bandage on Latest appearance: May 2nd, 2000 / First appearance: May 3rd, 1974 Franklin stands outside Peppermint Patty's door. Peppermint Patty stands on the step. Franklin says, "My grandfather has a birthday this week." Peppermint Patty walks with Franklin and asks, "Does he mind getting old?" Franklin replies, "No, he says it doesn't bother him . . . In fact, he says he feels great . . ." Franklin continues, "He says that once you're over the hill First appearance: August 12th, 1985 Franklin and Charlie Brown stand at the wall. Charlie Brown says, "I like talking to my Grampa . . ." Charlie Brown says, "I asked him if he'd like to be a yuppie . ." Charlie Brown continues, "'I don't have to be a yuppie,' he said . . ." Charlie Brown says, "I've already yupped!" First appearance: March 7th, 1979 Peppermint Patty and Marcie sit at their desks in school. Franklin says, "I was runner-up in the spelling bee! How about that?" Peppermint Patty says, "You weren't runner-up, Franklin . . ." Peppermint Patty continues, "You came in sixteenth . . ." Franklin says, "I was runner-up to the kid who came in fifteenth!" First appearance: October 30th, 1988 Peppermint Patty sits at her desk with her hands over her face. She says, "If she sees me, she'll call on me..." She closes her eyes and continues, "Please don't call on me!" "Please! Please!" With her head on the desk, she slouches in her chair behind Franklin. She says, "Psst! Don't move your head, Franklin..." She continues, "If she sees me, she'll call on me! Don't m First appearance: December 29th, 1986 Peppermint Patty sits on her bed and says into the telephone, "Hi, Franklin! About this 'War and Peace' we're supposed to read during vacation . . ." Peppermint Patty continues, "Why don't we sort of cooperate? You read 'War' . . . Marcie can read 'Peace.'" Franklin asks, "What will you read?" Peppermint Patty says, "'And'!" First appearance: April 22nd, 1979 Charlie Brown stands atop the pitcher's mound. He looks at Lucy standing next to the mound and asks,"Now what are you doing?" He rolls his eyes and grimaces as she replies,"I can see better here.' He points to his left and says,"Get out there in right field, and try to catch the ball!" He exclaims,"And I don't want to hear any excuses today!" He continues,"Don't try to te Latest appearance: April 20th, 2000 / First appearance: April 22nd, 1974 Charlie Brown and Lucy stand on the pitcher's mound. Lucy asks, "Hey, manager, how come we never try field goals?" Charlie Brown frowns. Lucy continues, "I'm standing in a field, aren't I? How come we can't try for a field goal if I'm standing in a field?" Lucy walks away. Lucy stands in the outfield and shouts, "Stupid manager!!!" Latest appearance: April 20th, 2007 / First appearance: April 22nd, 1960 Linus is looking towards his left. Linus stares at Charlie Brown, who has his tongue out displaying exertion, as he walks by dragging Snoopy in the grass, Charlie Brown explains to Linus, "Rabies shot." Linus goes back to minding his business as Charlie Brown continues to drag Snoopy. Latest appearance: April 26th, 2009 / First appearance: April 22nd, 1962 Charlie Brown and Linus stand on the baseball field in the rain. Linus says, "How can I play baseball in the rain? My glasses are so fogged up I can't even see!" Linus says, "This is stupid!" Charlie Brown says, "You're not quitting?!" Linus runs away saying, "Of course I'm quitting! Everyone else has gone home! Why shouldn't I?" Charlie Brown shouts, "But we need the Latest appearance: April 20th, 2011 / First appearance: April 22nd, 1964 Linus sits at a table, poring over papers. "This 'New Math' is too much for me!" he complains to Lucy. "You'll get on to it...It just takes time.." Lucy advises as she walks away. "Not me...I'll never get on to it!" Linus sweats. He turns and calls after her: "How can you do 'New Math' problems with an 'Old Math' mind?" Latest appearance: April 19th, 2016 / First appearance: April 22nd, 1969 Charlie Brown stands on the pitcher's mound. Peppermint Patty carries a bat and says, "Bad news, Chuck . . ." Peppermint Patty continues, "My team can't play your team today . . We have too many guys who aren't feeling well . . . We're going to have to forfeit the game." Peppermint Patty walks away and says, "You win, Chuck." Charlie Brown turns around and shouts, "All righ First appearance: April 22nd, 1977 Snoopy, as a helicopter, flies. Woodstock is the pilot. Snoopy continues to fly. Lucy jumps rope. Snoopy and Lucy lie on the ground tangled in the jump rope. Snoopy thinks, "May day! May day!" First appearance: April 22nd, 1998 As Schroeder plays his piano, Snoopy rests on the front and thinks, "Here's the World War I flying ace home on leave.." Snoopy has a mug of root beer. Snoopy sits up and thinks, "It's nice to be back among old friends where you're appreciated.." As Snoopy's root beer mug rests on Schroeder's piano, Schroeder tells Snoopy, "Please take your root beer glass off my piano.." First appearance: April 22nd, 1982 Molly Volley stands with The World Famous Tennis Pro. She says, "Hey! Good going, partner! We won the first game!" Molly Volley continues, "I've developed sort of a new habit on the changeover . . ." The World Famous Tennis Pro and Molley Volley sit on the bench. Molly Volley holds a bag of cookies and says, "Have a chocolate chip cookie . . ." Snoopy thinks, "My kind of pa Latest appearance: April 19th, 2013 / First appearance: April 22nd, 1966 Charlie Brown stands on the pitcher's mound and says, "When I get older I think I'll play in 'Little League.'" Charlie Brown throws the pitch and says, "Later on I'll play for my school team, then a little college ball, and then the major leagues!" 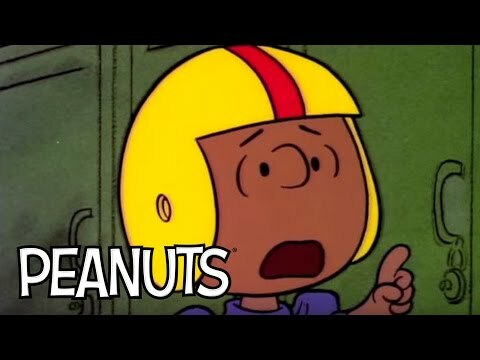 Charlie Brown gets knocked over by a ball. Charlie Brown thinks, "In the meantime, I have my problems!" First appearance: April 22nd, 1984 The beaglescout leans againgst a rock looking at an object in his hands. He smiles and thinks,"He's gonna be surprised." The beaglescout stands in the field with Woodstock and the other troops. He thinks,"Attention, troops!" He thinks,"This is a historic occasion..." He smiles and continues,"One of our members has completed all of his tests, and is now eligible to receive First appearance: April 22nd, 1986 Linus and Lucy sit on a couch. Lucy exclaims, "I'm the big sister and you're the little brother! That's the way it's always going to be!" Lucy exclaims, "It's going to be that way today, tomorrow, next week and forever!" Linus sighs. Lucy smiles and shouts, "Ha! I knew that'd get a rise out of you!" Latest appearance: April 19th, 2014 / First appearance: April 22nd, 1967 Snoopy lies on the doghouse. Lucy approaches. Snoopy smiles. Lucy shouts, "If you pull any of that cheshire-beagle stuff on me I'll pound you!!" Lucy walks away. 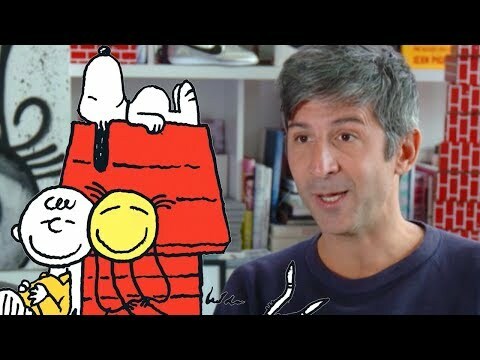 Snoopy disappears, except for his grin. He thinks, "Rats!" First appearance: April 22nd, 1992 Charlie Brown lies in bed. Sally stands behind him and says, "I hate to tell you, but it's time to get up for school . ." A groggy Charlie Brown asks, "If you hate to tell me, why do you tell me?" Sally starts to walk away and answers, "Because I really like to tell you . ." Latest appearance: April 19th, 2006 / First appearance: April 22nd, 1959 Patty and Lucy are on the baseball field. Patty says, "When you stop to think about it, Charlie Brown is the real backbone of our team.." She continues,"He's the clean-up hitter, he's the pitcher and he's the manager!" They both turn and watch Charlie Brown walking by. Lucy replies,"That leaves us with a pretty weak backbone, doesn't it?" Latest appearance: April 19th, 2012 / First appearance: April 22nd, 1965 Shroeder stands on the slope of the pitcher's mound and advises Charlie Brown: "Throw this guy your fast ball, Charlie Brown.." He tosses the ball to him. Charlie Brown turns around to see Lucy, who says, "I think you'd better keep the ball low to this guy, Charlie Brown...give him a low curve.." Linus stands on the ground next to Charlie Brown. He suggests, "Throw this guy all knu First appearance: April 22nd, 1990 Snoopy reads a sign that says, "Slow Children at Play." Snoopy walks along. He sees a stone fall next to a rock wall. He walks along. Snoopy sees another sign, readiong "Tripping Rock." A stone rolls by. Trip! The stone bounces. Snoopy rolls his eyes. First appearance: April 22nd, 1999 Rerun and Linus who has his blanket and is sucking his thumb watch TV.. Rerun says, "You're my older brother.. you're supposed to be my role model.." Linus says, "So what do you want me to do?" Rerun says, "Role" Latest appearance: April 19th, 2008 / First appearance: April 22nd, 1961 Charlie Brown points at Lucy and says, "You? You admit you were wrong? You? You?!" Lucy says, "Of course, Charlie Brown . . . And I'll admit that I've been wrong before . . ." Lucy says, "I remember the last time I was wrong about something . . . It was in 1958 I think . . . Along in July sometime, or was it August? Yes!" Lucy says, "The last time I was wrong was in Aug First appearance: April 22nd, 1991 Lucy stands in the outfield holding an umbrella. The rain drizzles down. Charlie Brown stands on the pitcher's mound and shouts, "You'll never be able to catch a ball while you're holding an umbrella!" The baseball bounces behind Lucy. Lucy asks, "How did you know that?" Franklin is thoughtful and can quote the Old Testament as effectively as Linus. In contrast with the other characters, Franklin has the fewest anxieties and obsessions. Franklin plays center field on Peppermint Patty’s team. Franklin met Charlie Brown at the beach and helped him improve his crooked castle. Franklin hopes to one day be a great hockey player in the NHL.